Boudreau will be back, but can Wild return to playoffs? ST. PAUL, Minn. (AP) — The subject of Bruce Boudreau’s future with the Minnesota Wild, the coach said, had not been broached with general manager Paul Fenton until a reporter quizzed the boss about it while they sat next to each other at the podium for their season-ending news conference. With another year remaining on his contract, Boudreau could have assumed the status quo, but given the fact that Fenton didn’t hire him and the Wild missed the playoffs this spring for the first time since 2012, well, his return was hardly guaranteed. 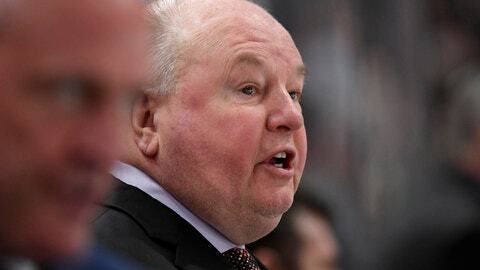 Fenton stopped short of a commitment to keeping Boudreau on the bench beyond the 2019-20 season, but he said he’s “sure” he will speak with Boudreau eventually about extending his current deal. Boudreau, who missed the playoffs for only the second time in his 12-year career as an NHL head coach, will need help, of course. The Wild scored only 210 goals, the fifth-fewest in the league , and went just 16-18-7 at Xcel Energy Center for the worst home record in 18 seasons as a franchise. Still, Boudreau pointed to the 101 points they posted in 2017-18, a total that would’ve won the Central Division this time. Fenton, without prompting, mentioned the slim salary cap space, older roster and depleted prospect pool he inherited a year ago upon replacing the fired Chuck Fletcher. He has frequently noted that each of the three forwards he traded this season, Nino Niederreiter, Charlie Coyle and Mikael Granlund, netted a younger player in return and didn’t cost a draft pick. “It’s a work in progress. I’m trying to do this on the fly, without having a rebuild as a lot of teams refer to it,” Fenton said. None of the Wild’s pending unrestricted free agents this summer is a core player. Notable restricted free agents include forwards Joel Eriksson Ek, Ryan Donato and Kevin Fiala, the latter two having arrived in deals for Coyle and Granlund, respectively, but the roster is again unlikely to undergo significant change. Defenseman Jared Spurgeon, coming off a career year, will be playing on an expiring contract unless it’s extended, one of the top offseason orders of business. The best remedy might just be improved health, with better vibes as a strong runner-up. Jason Zucker went from a career-high 33 goals to 21 in a season when he was the heavy subject of trade speculation. Mikko Koivu and Matt Dumba had major surgeries after being knocked out of action months ago. Even Zach Parise, who rebounded from a back injury with 28 goals, missed six of the last seven games with knee trouble. He revealed on Tuesday that he played through a broken foot earlier in the season.